Boon Edam Inc., a global leader in security entrances and architectural revolving doors, today announced that Martin’s Famous Pastry Shoppe, Inc. has installed a Boon Edam Tourlock security revolving door at its new corporate office in Chambersburg, PA.
An essential component of the newly-constructed building is the walking bridge that connects the corporate offices to the bakery. All employees will enter the bakery through the administration building using the new Boon Edam revolving door. This is a security and safety improvement, but it is also a cultural commitment that Martin’s employees are working together to bake the best products and provide the best sales distribution support in a safe environment. The safety and security of the bakery premises is required by regulations that food production companies like Martin’s must strictly adhere to. The Martin’s Facilities Department wanted the quality of its entrance to reflect the quality of the company and its excellent bread products. 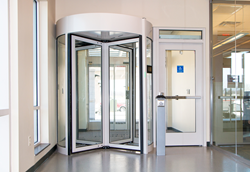 A Boon Edam Tourlock revolving door was chosen for the primary entrance to the building because it is secure using radio frequency identification and it has the all-important ability to reject tailgating attempts. The new building opened in July and the entrance was installed at that time. The Human Resources Department provided training and orientation for employees on door operation. “The Boon Edam entrance addresses our major concern about tailgating, we’re pleased.” said Franzoni. Martin’s Famous Pastry Shoppe, Inc. is an all-American family owned and operated company headquartered in Chambersburg, Pennsylvania focused on baking great-tasting potato bread products using high-quality ingredients. Martin’s dedication to excellence, quality, service, and family values are what truly sets them apart from their competitors. Martin’s continually pursues a higher level of service and best practices in the baking industry. They have seen bread and roll production advance from hand production to the now state-of-the-art mechanical production. The recent construction project includes a major expansion of the bakery and warehousing space, as well as increased space and functionality for the transportation department. To learn more about Martin’s Famous Potato Rolls and Bread, you can visit their website at: http://www.potatorolls.com. With work environments becoming increasingly global and dynamic, the entry has become the center of activity in and around many buildings. As the importance of the entry as a mobility hotspot increases, the demands we put on managing the passage of people through them grow. Royal Boon Edam is a global market leader in entry solutions. Headquartered in the Netherlands, with 140 years of experience in engineering quality, we have gained extensive expertise in managing the movement of people through office buildings, airports, healthcare facilities, hotels and many other types of buildings. We are focused on providing an optimal experience for our clients and their clients. By working together with you, our client, we help determine the exact requirements for the mobility hotspot in and around your building and develop a solution that is customized for you in three key areas: sustainability, security and service. You can find more news about Boon Edam on http://www.boonedam.us/newsroom.